On July 7, the Treaty on Maritime Delimitation and Cooperation in the Barents Sea and the Arctic Ocean, which delimits the long-disputed boundary in the eastern Barents Sea between between Norway and Russia, will finally go into effect. 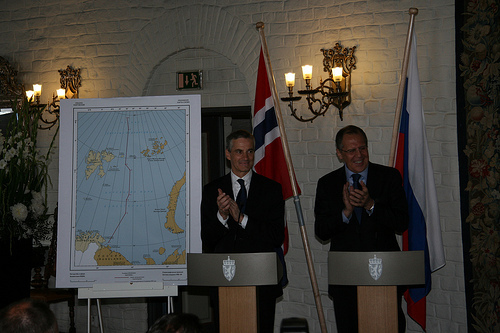 Yesterday, Norwegian Foreign Minister Jonas Gahr Støre and Russian Prime Minister Sergei Lavrov exchanged the instruments of ratification in Oslo’s Akershus Castle. The treaty was initially signed on September 15, 2010, after a preliminary agreement was reached in April of last year. Both countries’ legislative bodies deliberated the treaty before eventually ratifying it. In the U.S., a group of Republicans will tour Alaska on Thursday to ostensibly learn more about the “obstacles” to increasing drilling in the last frontier. The chairman of the House Natural Resources Committee, Doc Hastings (R-Wash.), will be joined by Alaskan representative Don Young and the state’s governor, Sean Parnell. The group will fly over the National Petroleum Reserve-Alaska (NPR-A) and then attend a community meeting in the traditional village of Kaktovik (population 293), located within the Alaska National Wildlife Refuge (ANWR). Lately, Hastings and other GOP members in Congress have been trying harder than usual to amp up production in Alaska. On June 2, the Subcommittee on Energy and Mineral Resources, which falls under the Natural Resources Committee, held an oversight hearing on energy prospects in Alaska and the fate of the Trans-Alaska Pipeline, whose flow of oil has been steadily decreasing and is only at a third of its peak. At the hearing, entitled, “Domestic Oil and Natural Gas: Alaskan Resources, Access and Infrastructure,” representatives listened to witnesses from the Alaska Department of Natural Resources, the Arctic Slope Regional Corporation, Shell, and the DoT’s Pipeline and Hazardous Materials Safety Administration. Most of the witnesses spoke in favor of increasing energy production in Alaska. Richard Glenn, the Executive Vice President of Lands and Natural Resources for the Arctic Slope Regional Corporation, which is a company owned by Alaska Natives, testified, “Safe, responsible oil and gas development is the only industry that has remained in our region long enough to foster improvements to our remote communities.” Indeed, he advocates opening up exploration activities in the NPR-A, which is separate from ANWR, larger, and less controversial (though there have been some conservationist efforts to turn the land into an ecological preserve). President Harding created the 23.5 million acre NPR-A in 1923 as an oil reserve for the U.S. Navy that at the time was shifting its main energy source from coal to oil. Despite all the excitement about the NPR-A’s potential, last year, the USGS discovered that there could be only 10% of the oil in NPR-A than was estimated in 2002, as more recent drilling showed that much of what was thought to be oil is actually gas, and much of what is oil is of poor quality. Still, last month, President Obama announced that he would open up more of the NPR-A to drilling and extend leases for drilling in the Barents and Chukchi Seas, which were affected by the moratorium on offshore drilling in the wake of the Deepwater Horizon disaster. Obama has been under pressure to help alleviate the high prices at the pump, but increased drilling in Alaska won’t have any immediate effects, since it will take years for any oil from new wells drilled there to eventually reach people’s tanks. If the tour of Alaska is meant to shed light on the obstacles to drilling, then perhaps Hastings should have taken a tour of Washington, D.C.